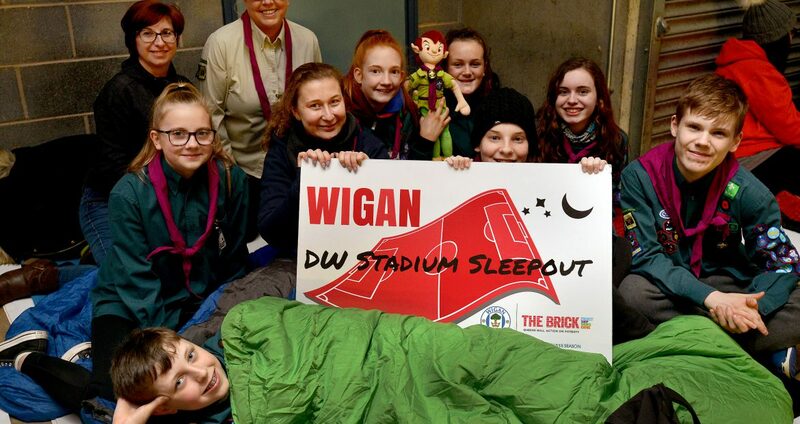 More than 100 people support The Brick Stadium SleepOut	"
More than 100 Wiganers swapped their beds for sleeping bags in support of our annual SleepOut to raise vital funds to make sure no person in our community is left behind. This year, we teamed up with our charity partner Wigan Athletic to host the annual event, so people could spend the night sleeping in the south stand concourse at the stadium and raise funds to help people facing homelessness, poverty or debt crisis across the borough. Families, scout groups, businesses, and individuals joined in with the event – with one young girl even bringing along her GCSE revision, and another woman, Donia Lee, who had previously been homeless herself, also showing her support. The 31-year-old, who is now happily settled with a job, partner and son, said: “When I was younger I went through a similar experience, where I was living out on the street for a period of time. We are truly grateful to everyone who got involved on the night. To show your support, you can donate to our Stadium SleepOut Just Giving page.